The final day of PAX Prime 2013 has come and gone; a bitter-sweet ending to an excellent show. I’m sad to see it go; I mean how am I going to get my 3DS Street Passes now? I don’t know about you, but where I live being n the vicinity of another active 3DS is a rare thing. Ah well, there’s always the local Gamestop I suppose. Anyway, before the day concluded I managed to get some time in with a few more upcoming releases. From what I saw, we won’t be getting anything ground-breaking with these games, but each one gave this attendee plenty of reason to look forward to the coming months. The first game I got a look at was Sucker Punch’s upcoming release Infamous: Second Son. What we were shown was a demonstration of some of the many powers at your disposal in the game. Infamous fans will be familiar with some of these, as we have the standard bolts (smoke/fire based this time) and gliding abilities. However, that isn’t to say that there aren’t unique abilities to be found. As your character is a smoke-based Conduit, he can do things like phase through some obstacles and cast himself up through drainpipe and ventilation ducts. The ultimate attacks from the previous games make a return here as well. The one we were shown involved, our character throwing himself high into the air and impacting the ground in a bombastic explosion of flame and smoke, laying waste to every enemy and structure in the general vicinity. With these new moves and an environment more interactive and destructible than ever before, Second Son is looking to be a solid entry into this already excellent series. Oh, and if the trailer we were shown was any indication, you will be able to absorb the powers of other Conduits. Yeah, that happens. I also got a look at Assassin’s Creed: Black Flag, which is doing everything it can to become the quintessential pirate game. What we were shown was a massive world for any would be pirates to sail, loot, and plunder. Naval combat has been upgraded in Black Flag. Not only do you get to sail the seas sinking the ships of those pirate hunters foolish enough to challenge you, but you also get to board and capture them to be added to your own private fleet. That’s right, in Black Flag you get command of a pirate fleet! Aside from that, we were shown how the underwater environment factors into the game, and it turns out that it’s going to be a big part of it. You can explore the ocean floor looking for sunken wrecks to pillage and entrances to smuggler’s coves, all the while taking care not to be spotted by sharks or other underwater predators. If your think the ocean is a safe place in Black Flag, think again. You’ll need to be just as careful in the water as you are out when out of it. Then there’s Final Fantasy XIII-3: Lightning Returns, the only one of these game that I actually got some hands-on time with. First off, those of you looking for a departure from the combat model of the last couple of games will sort of get your wish. The combat system is different but in a way that still involves paradigms. It’s a streamlined version of the paradigm system. As Lightning, you still change roles as you fight, but what the switching does is cycle between different four move sets. No longer will battles be fought automatically by moves chosen by the computer based on which role you’re using. In this game, you are in control of every move Lightning makes. This change takes a large portion of the drudgery out of combat that was present in the last two games. Each encounter is much more personal, and much more engaging as a result. The rest of the system has remained intact though. You still have to determine enemies’ weak-points and whittle them down with the appropriate magic until you stagger them to begin inflicting massive damage. Other new additions include the new “Overclock Mode” which slows time for everything except Lightning, allowing you to inflict much, much more damage when it’s active than you otherwise could. Finally, healing items are no longer irrelevant since your health does not regenerate between battles. You will need to pick your engagements well and manage your items carefully if you’re going to make progress in this game. These changes are definitely an improvement, but the rest of the game still feels like you’re just traversing from encounter to encounter. Hopefully this won’t be the case for the full game, but as far as the demo goes, the trend holds true. Well, that’s it for the show. Be sure to check out the new pictures on our facebook page, and keep checking back during the week for our interviews with some of the devs at the show! Cool, I’m happy about those changes for the next “FFXIII”. While I liked the previous two games more than most people did, I still didn’t like the automatic battles. It made fighting quite boring. 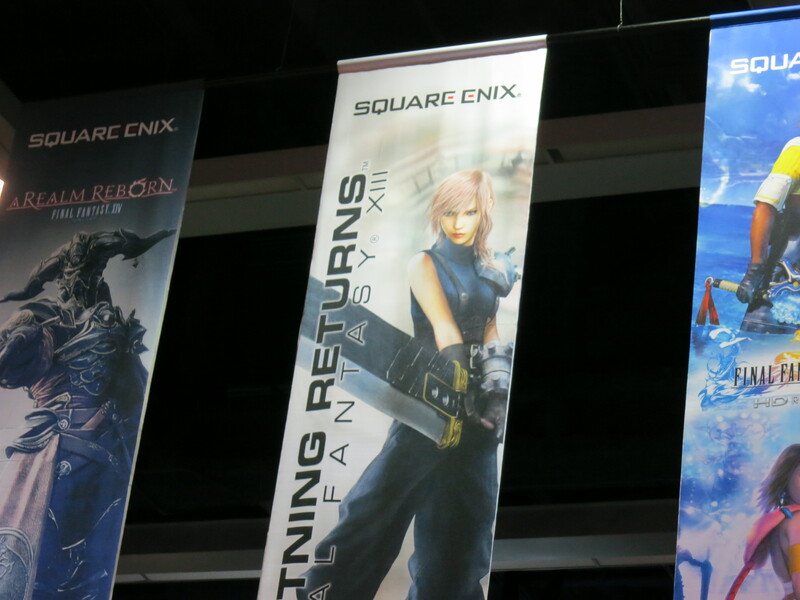 By the way, why is Lightning dressed like Cloud? I really don’t know. I’m guessing it’s a bonus costume for people to unlock or download.